With the timing of the move to the new farm, there was no fall garlic planting for this year. Very sad—over the last three seasons, we’ve grown 2,000-3,000 bulbs a year, it’s a much-loved crop all around (starting with me! ), and it’s been the very first sign of new veggie life as the fields wake up every spring. Oh, well, we should be back to full-on garlic this fall! Meanwhile, what we have INSTEAD is about 200 of the toughest, most I-will-survive garlic cloves ever, going in today for a really late start, late even for spring planting! After long months of storage, and an accidental total freezing, the loss of garlic I’d been saving was pretty huge, these 200 out of maybe a thousand. The guys who made it got an overnight cleansing and rejuvenating bath in a mild solution of baking soda (anti-fungal) and kelp extract (boost), and they’ll be quickly rinsed in alcohol just before going in. Especially for this small, late planting, all this prep probably doesn’t matter much, but they deserve it (personify and pamper your seeds and plants when you can, it’s friendly, until you harvest and eat ’em!). 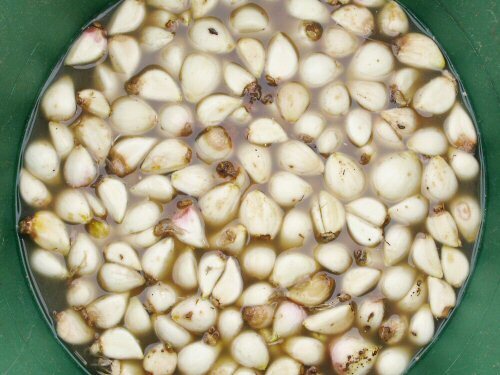 So, it’ll be a first-hand test of whether it’s worth planting spring garlic at all. From what I’ve heard, chances are we’ll get at best smaller, later bulbs, some misfires with no bulbs forming, and the same great garden-grown garlic taste! We shall see…! First veg in the field: it’s peas! Hopefully they grow beautifully. My garlic, which I planted last fall (my first time growin garlic) is doing well, I’m so very excited. My biggest ones are 2 feet tall. I can almost taste the garlicky goodness already! Mangochild: Yeah, I guess no matter how the bulbs turn out, there will be the greens. I wonder if the scapes will be the usual size. We’ll see…! Deb: Can’t remember exactly, but within a few days you should see at least a couple poking up. They come up pretty quick! Mike: Thanks – I’ll keep my eyes pealed. Last fall I planted hundreds of garlic bulbs. I have planted garlic for years where I used to live and have had great success, but this time something ate most of the bulbs and I hardly got any crop at all. I live in Hillsdale Michigan and that is where I had the problem. I believe it was insects in the ground and not moles, squirrels or deer. My soil is very sandy. Just curious as to how your spring garlic crop made out? What type of garlic is it?When did you harvest it? Did you ever try planting it in the fall? We live in Bancroft, Ont., zone 4 / 5. We normally grow hardneck “Music” which is planted in the fall but in 2009 we lost a large part of our crop because it was so wet and cold. To make a long story short, we won’t have enough to sell in ’10 so we’re contemplating planting spring garlic and we don’t know what to expect. I’m looking forward to planting some garlic this fall. Do you have any tips for me? Actually I do have one tip for you …. if your beds run from east to west slope then 10 to 15 degrees to the south. It does make a difference. The first year we made the ( 3 )beds oriented that way, the south half of all 3 beds were taller than the north half. Did it make a difference in the weight of the bulbs ? ….. I don’t know, we didn’t weigh them. It is a nice sight first thing in the spring, ours are 4″ tall right now. Thank you for the tip! I will definitely try that. I love to see things growing early in the spring!